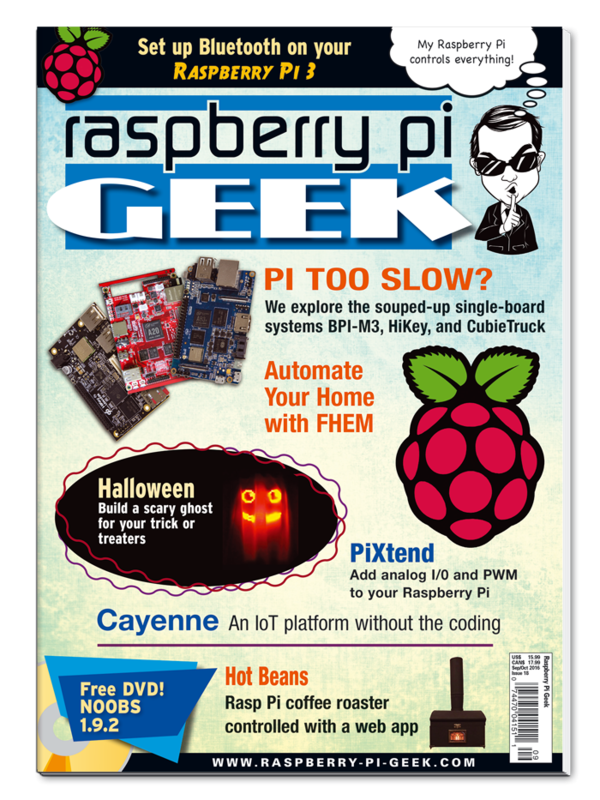 Issue # 18: Pi Too Slow? In this issue we explore some powerful home automation tools and try out some alternative multicore single-board systems. The Raspberry Pi 3 comes with Bluetooth already on board. We'll show you how to connect your Pi with Bluetooth devices. This flashy single-board system offers high performance and easy configuration. Enable desktop notifications in Raspbian, and display the messages on an Arduino LCD display. We test drive the Banana Pi M3 and LeMaker HiKey. Use this cool control system to automate your home. Keep tabs on your IoT devices with this handy platform designed for the Pi. Transform an old air popcorn popper into a coffee bean roaster controlled by a Raspberry Pi. Create scary special effects for your Halloween display. Add analog I/ O and PWM connections to the Raspberry Pi. Create a wireless slideshow clicker. Getting a handle on Arduino boards can be difficult. A Scratchlike graphical programming environment can make the learning curve easier to climb. Make a custom handheld wireless remote control with littleBits Wireless Transmitter and Receiver bits.